Summer is arriving and the weather is getting hotter. Before they storm out of the house, make certain your family is protected from the heat, overexposure to the sun, bad injuries, bugs, etc. 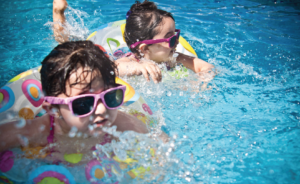 Summer energy makes the kids run faster, play harder; and with the increase in activity, we need to be meticulous when it comes to protecting the little ones. With all that in mind, summertime requires an extensive amount of preparation. Legacy Academy Frisco has prepared a list of tips on how to protect your child through various situations during the summer! UVR’s and essentially protect the skin from being sunburned. Apply 15 to 30 minutes before sun exposure so that the skin can absorb the components. After that, it is also important to reapply the sunscreen every 2 hours and after sweating or swimming. Cover, cover, cover. Clothing and hats are great for blocking the ultraviolet rays. The market offers many options of lightweight clothing made for swimming and outdoor activities that can project the neck, elbows, and knees. Infants should stay out of the sun. Babies that are 6 months or younger should not be directly exposed to the sunlight; and they need to be wearing protective, comfortable clothing and hats. Try to schedule outdoor play during the morning. Avoid engaging in outdoor activities during the peak hours of the sun which are between 10AM and 4PM. If you have to be outdoors in peak sun periods, at schedule regular breaks from the sun. Shades are shady. Don’t fully trust that shades will provide protection from UVR light. It may give relief from the heat, but your child can still get sunburned in the shade. Avoid any type of distractions. Stay off phones or any other distractions when your child is in the water. Pay close attention to the danger zone (the water). Learn the basics. Acquiring a CPR certification is vital and it should be renewed every year before every summer. Water incidents can happen any moment and it’s important to know how you can save the life of your own child or someone else’s. Spray, spray, spray. Just like sunscreen, when there is an outdoor activity, it is important to spray repellent on children’s skins and clothing. Applying once, however, is not enough. When the little ones sweat it off, it is important to respray it to ensure full protection. Allergic reactions, beware. Most children experience some kind of swelling from a bug bite, which is a type of allergic reaction. But for some children, bites and stings can be life-threatening. Watch for severe swelling or difficulty breathing and seek medical attention quickly if a child seems in distress. Some repellents can also cause allergic reactions, so follow directions on the sprays closely. Take breaks to specifically drink fluids. For example, kids under 90 pounds need to be drinking at least 5 ounces every 20 minutes and those over 90 pounds should take 9 ounces every 20 minutes. To help you measure it, one gulp that your kid takes is about half an ounce of fluid. Don’t let the risks scare you from letting your children have fun. Summer is a great time to be active and together as a family; but it’s always good to be informed and alert. Have you heard of our Summer Camp Program at Legacy Academy Frisco? Call 214-436-4755 or click here for more information.